From the leading expert in FODMAPs and IBS, this is the go-to guide and cookbook for overcoming IBS by discovering your FODMAP sensitivities and eliminating them from your diet. Originally self-published as IBS-Free at Last! and now expanded with 50 recipes, this is the bible of the low-FODMAP lifestyle. FODMAP is an acronym for a group of difficult-to-digest carbohydrates found in wheat, milk, beans, and soy, as well as some fruits, veggies, nuts, and sweeteners ("fermentable oligo-, di-, mono-saccharides and polyols"), and this book walks you through eliminating all of them from your diet, and then adding them back in one by one to discover your unique sensitivity fingerprint. Originally developed by researchers at Monash University in Australia, the low-FODMAP diet offers relief to IBS sufferers (estimated 64 million in the US), as well as those with Crohn's disease, ulcerative colitis, and nonresponsive celiac disease. The IBS Elimination Diet and Cookbook offers the theory along with a step-by-step elimination program, comprehensive Q&A's, delicious recipes, and 25 full-color photos. 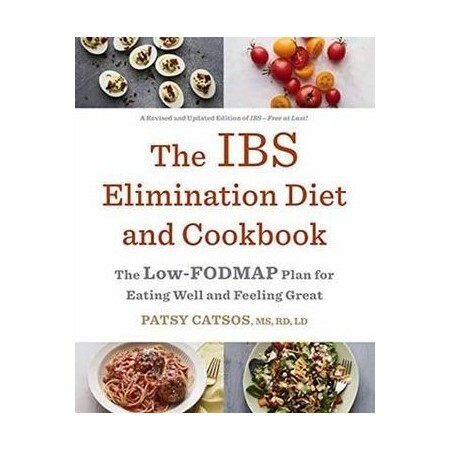 Patsy Catsos, MS, RD, LD, is a leader in the field of low-FODMAP diet. A nutritionist based in Portland, Maine, with a BS in nutrition from Cornell University and a master's degree in nutrition from Boston University, she completed her internship at Boston's Beth Israel Hospital and now maintains a private practice. She also speaks at conferences for other nutritionist and doctors. She was first to publish a book about the low-FODMAP diet, IBS-Free At Last! in 2009. Before long, it was adopted not only by IBS sufferers, but by health care professionals and major medical centers. Her step-by-step elimination diet is updated for ultimate usability and effectiveness in this new edition, The IBS Elimination Diet and Cookbook. It helped set the standard of care for patients using diet, not medicine, and continues to be the most recommended by doctors. She lives in Portland, Maine, with her husband, Paul.